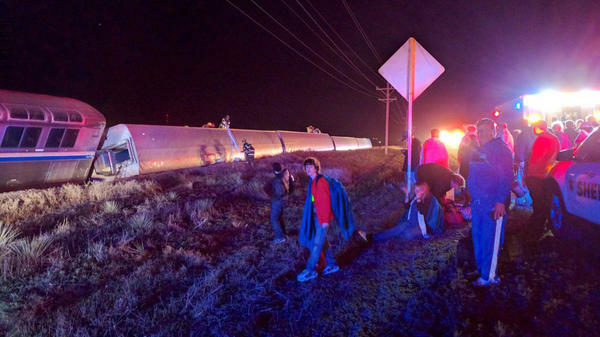 Passengers gather after their Amtrak train derailed near Dodge City, Kan., early Monday morning. After Amtrak's Southwest Chief train derailed just west of Dodge City, Kan., shortly after midnight Monday, in an incident that sent some 32 people to hospitals, investigators are focusing on a possible problem with the track. The train was carrying 131 passengers and a crew of 14, Amtrak says. Earl Weener of the National Transportation Safety Board says there is an indication there was some misalignment in the rails. Weener says that the engineer saw something wrong with the tracks and that his quick action in implementing the emergency brakes may have prevented the derailment for being worse. The Southwest Chief runs between Chicago and Los Angeles; according to local reports, five of the train's cars were left on their sides by the derailment. Amtrak said the train had nine cars and two locomotives. The more than 100 passengers who weren't injured spent the night at the 4-H Recreation Center in Cimarron, Kan., and would reach their destinations by alternate means, Amtrak said. Amtrak initially said "approximately 20" passengers had gone to the hospital, but that number rose after people sought medical attention after arriving at the community center. Amtrak now says that 32 people went to the hospital, and that all but three were discharged Monday morning. Citing a government official, the AP reports that before the train derailed, the train is believed to have been traveling around 75 mph. The derailment occurred on tracks that are owned and operated by BNSF Railway. From what a passenger tells local CBS TV station KWCH, the derailment seems to have started with cars at the rear of the train. "We realized something was definitely was wrong after the shaking and we stopped. We got out and saw that four or five cars in the back, the coach cars, were on their sides," Daniel Szczerba says. Szczerba also took photos and video from the crash site that he put on Twitter. Speaking to KWCH, he described the scene as emergency crews quickly arrived and people pushed out emergency window exits. "A lot of people just looking for family members," Szczerba says. "Of course all the lights went out, it was dark. People traveling in groups in four or five got thrown around the car as it turned over and lost people as they were trying to get out of the emergency exits."